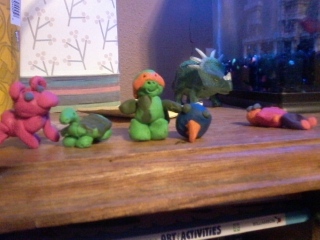 Playtime has been claytime lately at our house, especially when it’s cold. I am loving Wood Sprite’s creations. She filled a shadowbox with tiny clay furniture, a basketball hoop and ball and little creatures the other day. Here are some recent creations, including the pot-bellied pig she wants as a pet and Michelangelo (from Teenage Mutant Ninja Turtles). Normally I love April Fool’s and really get in the spirit with my loved ones but not so much this year. We are all grief-stricken and not up for pranks. I did keep my promise to Wood Sprite and made her a silly breakfast, complete with waffles with a grape face and blue milk. Wood Sprite, on the other hand, tried to prank us all day. Then she ended the day with this lovely tribute to my cousin that I wanted to share. 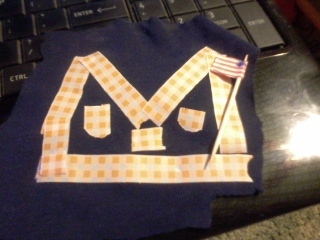 She made the fox out of tape and an old shirt, and the tiny flag out of tape and a toothpick. She is using the latter in her dollhouse as tribute to him, and she gave me the fox flag for my office.